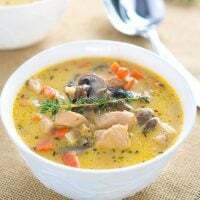 On this list, you will find easy healthy soup recipes for fall and winter. 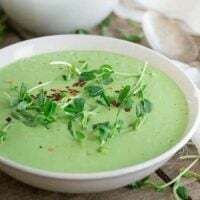 Whether you choose a few recipes you haven’t tried before or go for a different variation of your favorite classic, at the end of the day, you’ll have a healthy and satisfying bowl of soup to enjoy. 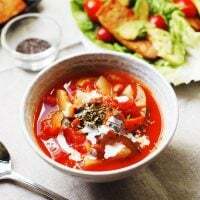 Cooking healthy soups is a great way to stay on track with your healthy eating because you can cook a big pot of soup on the weekend and then eat it a few times during the week. Soups with good sources of protein and fiber are usually filling enough to be served for lunch or dinner. 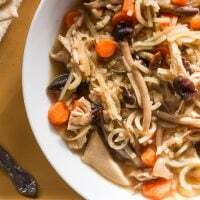 A bowl of warm hearty soup is very comforting and satisfying and is a perfect meal for fall and winter. Hearty soups are usually good for freezing. So, you could cook two or three different soups and put them in the freezer. This way your family members won’t get bored eating the same soup all week long. In general, making soup is very easy. All you have to do is cook some vegetables, grains, and sometimes meat or fish in some liquid. 1. Choose healthy nutrient-rich vegetables. They will add fiber to the soup and make it more nutritious. 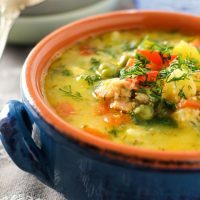 The best vegetables for fall and winter soups are winter squash, cauliflower, carrots, cabbage, beets, onion, garlic, leeks, celery, and bell peppers. 2. Add lean protein sources. If you eat meat, use chicken, turkey or fish. Don’t forget about plant-based protein sources such as lentils, beans, and chickpeas. They are nutritional powerhouses and will help you stay full longer. 3. Use low glycemic whole grains such as quinoa, barley, bulgur, or wild rice. They will add more bulk to the soup and make it more filling. Whole grains are also high in minerals and vitamins. 4. Add some leafy greens to the soup. 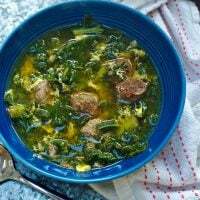 Leafy greens such as kale, spinach, beet greens, collard greens, and Swiss chard will add color to your soup and boost its nutrient content. When it’s cold and dark outside, nobody wants to eat a salad. So, adding leafy greens to your soup helps to get more of them into your diet during the cold time of the year. 5. Choose low sodium stock. It’s always a good idea to make your own homemade stock. You can also buy good quality chicken or vegetable stock at a grocery store. When buying the stock, check the ingredient list and make sure it has no weird ingredients listed. All you want to see are chicken, vegetables, and spices. 6. Boost the flavor of the soup. Fresh and dried herbs such as parsley, dill, cilantro, thyme, oregano, basil, chives, and rosemary will take your soup from good to great. The best spices for soups are paprika, cayenne pepper, hot pepper flakes, black pepper, garlic, and onion powder. Adding some lemon or lime juice can also help highlight the soup flavors. You can also boost the savory umami flavor by adding some low sodium soy sauce or coconut aminos. As you can see, it’s quite easy to cook a healthy satisfying soup. You can even create your own unique recipe using the things you already have in your fridge and pantry. 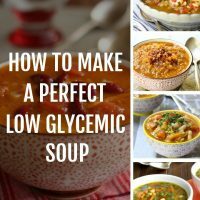 If you want more tips and tricks, check out my guide to making a perfect low glycemic soup. Or just go straight to choosing an easy healthy soup recipe from the list below. 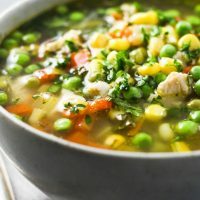 On this list, you will find easy healthy soup recipes from my favorite food bloggers. Go over the list and pick three to four (or more!) new recipes that you think you and your family would like.Try these new recipes and adapt them to your taste preferences. 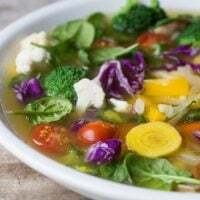 This way you will have a few new healthy soup recipes to add to your weekly rotation.The recipes on this list are in alphabetical order. 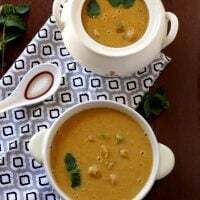 This healthy and easy to make soup is full of wonderful nutrients and fiber. Make a big pot and enjoy all week long. 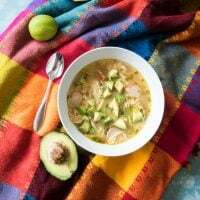 This super satisfying soup is full of shredded chicken, chunks of avocado, bites of radish, and amazing lime and cilantro flavors. 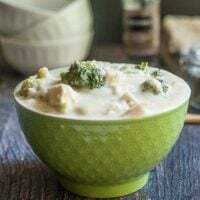 This creamy chicken & broccoli soup uses cauliflower cream to make a healthy, hearty soup. You can make this recipe in less than 30 minutes. 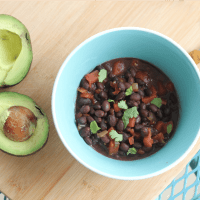 A healthy, comforting meal that will fill you up and make plenty of servings so you can have leftovers for lunch or freeze the rest! Ready in 30 minutes. 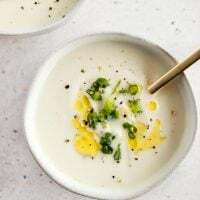 This creamy soup is made with fresh cauliflower, onion, and cashews. It's a delicious dairy-free staple any time of the year, but especially during the cooler months of the year. 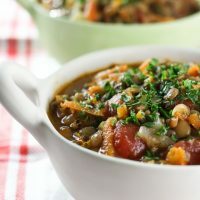 This lentil soup is the perfect comfort complete healthy meal for the entire family! 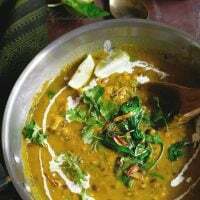 Simple and easy curried lentils. Very quick to make and super satisfying. 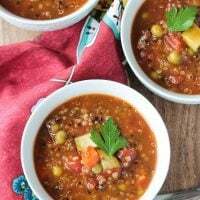 Even though this Greek lentil soup is meatless, you won’t miss the meat because this soup is full of protein and fiber from lentils and vegetables. 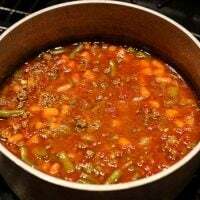 This is an easy, delicious, and healthy low-carb Hamburger Soup that has the potential to become your favorite hearty go-to soup for fall and winter. 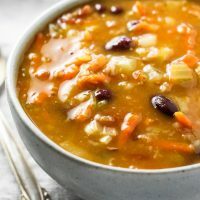 This Hearty Butternut Squash Barley Soup is full of healthy protein, low glycemic grains, and super healthy vegetables. Make it on the weekend and enjoy all week. 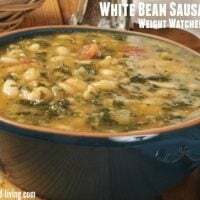 This Hearty Chicken and White Bean Soup is really easy to prepare, healthy, filling and comforting. No need to worry about making your dinner in a hurry, just warm up a bowl of this soup and enjoy. 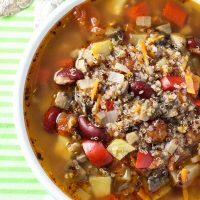 This Hearty Ground Turkey Soup is high in protein and fiber. 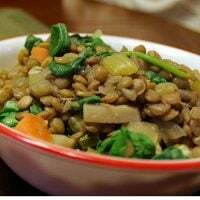 It’s super flavorful and comforting because it’s a little bit creamy thanks to lentils and barley. This hearty vegetable soup is filling, warming, comforting, and satisfying. It’s a perfect soup for those times when you want to cozy up on the couch with a bowl of soup. 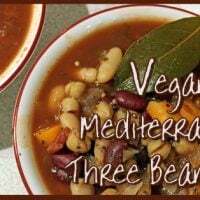 This delicious vegan soup is deceptively low in calories! At about 190 calories per serving, you get 17 grams of protein, 20 grams of fiber and a dose of nutrition to keep you going through the fall months. A very filling soup with a lot of flavor. You can't really go wrong with a spicy Italian turkey sausage, vegetables, lentils, and spinach. 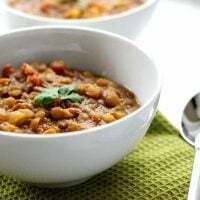 This vegan Middle Eastern garbanzo bean soup has a very simple yet satisfying flavor. And the best part is that you can have it ready in just 30 minutes. This soup is packed with vegetables and incredibly flavorful. It’s also full of protein thanks to mushrooms, beans, and quinoa. This soup is perfect for recovering from the busy holiday season. Use leftover turkey from Thanksgiving or make it completely vegetarian for an extra healthy meal. This chicken soup is made without noodles. But you are not going to miss them because this soup is very filling and comforting. 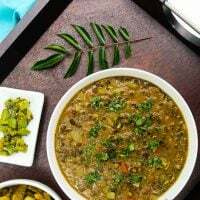 Organic mixed lentils cooked with vegetables and Thai curry paste form the base for a delicious and comforting soup that is rich in nutrients, minerals and extremely wholesome. This soup is delicious and really good for you. It’s packed with protein from the cute little meatballs and lots of leafy kale. 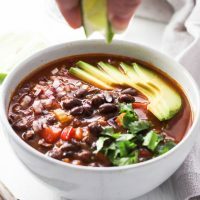 This black bean soup is hearty, filling, and deliciously spicy. It's made with just 5 ingredients and can be ready to serve in 15 minutes. This recipe is very easy to make using the ingredients most people already have on hand. Garnish this soup with your favorite toppings and you'll have a perfect bowl of soup. 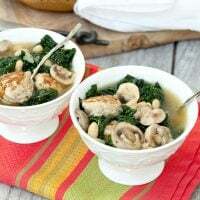 This dairy and gluten free soup can be made in about 30 minutes, making it perfect for a weeknight meal. It's packed with nutrition and flavor. This Salmon Corn Chowder is made with coconut milk and veggies. It’s very comforting and filling enough to have for dinner. This soup is easy to make and very flavorful. 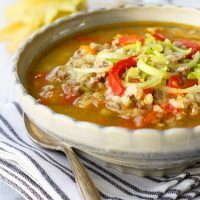 If you like stuffed banana peppers you will love this sausage & peppers soup! This is the most colorful soup you will ever make! It's loaded but still very light. You can add some shredded rotisserie chicken or tofu for more protein. 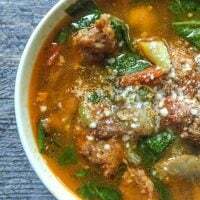 Make a delicious and healthy Italian meatball soup in your slow cooker filled with little meatballs, beans and spinach. This Thai pea soup is made completely in the blender. With ginger, lemongrass, coconut milk, jalapenos and peas, you'll want a big bowl. This soup is just as tasty as takeout and guaranteed to be totally plant-based. Great for a chilly fall or winter evening. 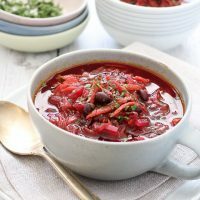 Red wine lends this soup an interesting rich flavor. Substitute more vegetable broth if you prefer to cook without the wine. Carrots and celery in this soup form the vegetable stock. So you are making vegetable stock AND minestrone at the same time. 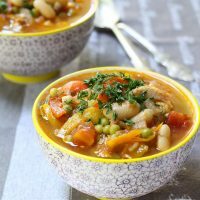 This hearty soup warms you up from the inside out and makes all those winter blues seem to disappear, at least for a few minutes! 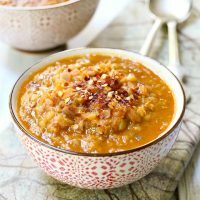 This spicy red lentil soup is delicious, filling, comforting, healthy, dairy-free, vegan, gluten-free, and simply perfect. It’s also spicy enough to warm you up on a cold rainy day. 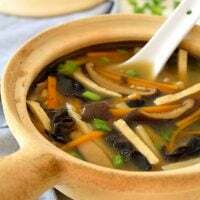 Thanks for including my hot and sour soup recipe. All these recipes look delicious, great round-up! 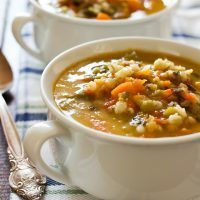 Thank you for including my Hamburger Soup recipe! I love eating soup in the winter and am trying to shed my belly rolls. Can’t wait to try all these other great looking recipes! Wonderful round up and much needed recipes! 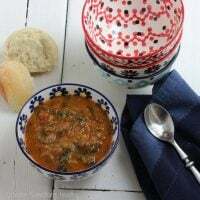 Thanks for the mention of my Middle Eastern Chickpeas Soup recipe. I cannot wait to try that one!